There’s just something about interactive cards! 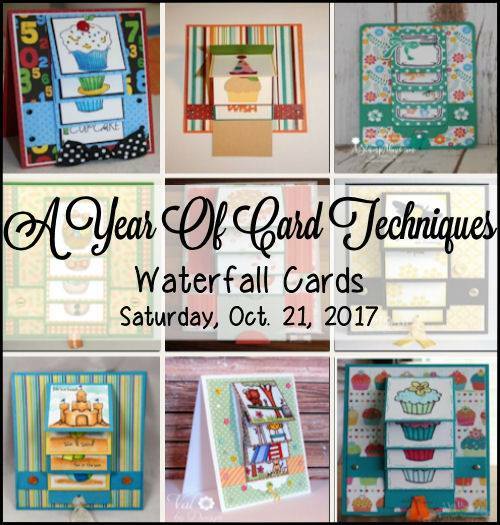 And Waterfall Cards are among the best interactive card techniques. They look intricate, though, so we’ll let you in on any hints we uncover along the way. Hopefully, we’ll inspire you to try one for yourself. Please take a moment to check out their store here, their blog here and their Facebook page here. And the awesome prize this month is $12.00 gift code to the store (about four digi images). We really appreciate feedback, so please leave a comment on each of the blogs in the hop today. The winner will be announced on Sunday, October 29, 2017, on A Piece of (my) Heart’s blog, so be sure to check her blog on Sunday. If you would prefer to be notified if you win, please leave your email address in the comments and someone will contact you. The winner will have until November 16, 2017, to claim their prize. You should have arrived here from Wilma's blog.. If you're visiting here first, you might want to start at the beginning so you don't miss a thing and increase your chances of winning by commenting on each blog. I love making these cards and use to make them all the time. Once you figure out the measurements, they're not that hard. I have a friend visiting and I even put her to work making one. We plan on giving these to the local VA hospital during the holiday season. These are the three I made. This is the one my friend made. This last one is special because it was made for me a few years ago by a good friend and her children. I love the torn tree shape. It shows how creative you can get with these and her children did most of the work on it. Here is a quick (and I mean quick) video to show you what is on each panel of the cards we made. The last card in the video with animals, I used colored pencils to color the animals. Now you’re off to visit with Lisa.. Hope you had fun and thanks for stopping by. See you next month with another technique! Your trio of cards are wonderful and your friend's is great, too! And I love the one you received previously....I've never seen a shaped waterfall card before! 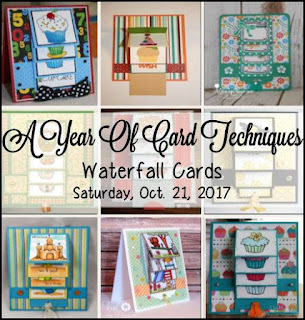 I'm so impressed with all of these waterfall cards, and yours are amazing. You've got me in the holiday spirit with these. Beautiful work. These are wonderful and I love how creative the tree is that your friend made. Great cards! I really like how you stamped words to show on each level to make the full sentiment. Thanks so much for sharing these. Great job! I love the Christmas music in the video! Great job! And fantastic idea to include written instructions. I will keep that in mind for the next hop. I added a video, too, but yours was so much better. I didn't even think to add music, etc. Awesome job all around! Fun cards, make the holiday fun!! Smiles!! Jearise I love you cards. I never thought of cutting the squares like you did with the Christmas tree. Thanks for hopping along with us.